Google today updated its Google Maps app for Android devices with new tab-based tools meant to help access real-time information with a single tap. Moving forward, three tabs appear at the bottom of Maps' home screen: places, driving, and transit. The places tab will reveal a set of curated, nearby locations such as diners, coffee shops, ATMs, gas stations, and other such destinations. The driving tab will provide real-time ETA data between home and work, with traffic alerts when in driving mode. Last, the transit tab will make it easier to discover bus/train schedules, see when the next arrives, and get ETA data for arrival times. Google Maps has long offered these functions, but they were not always available directly on the home screen. Moving them to dedicated spaces that can be opened with one press should help make them more accessible and, Google hopes, more useful. The new tabbed version of Google Maps is rolling out to Android devices starting today. Google has found another way to link people with retailers, restaurants, and shops. 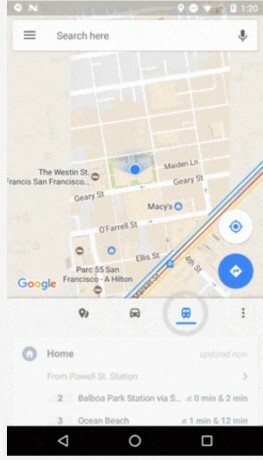 Using Google Maps for Android, people can search for their favorite places, such as coffee shops or record stores, and tap the new "Follow" button. Google today announced a significant change to the appearance of Google Maps. According to Google, it has updated the look of driving, navigation, and transit maps in a way so ancillary information is more visible, such as gas stations when driving or train stations when riding the rails. Google today is making some additions to Google Maps that it hopes will help people get to work quicker and with less stress along the way. The app has added a "commute" tab that offers one-tap access to live traffic and transit details that are personalized for each person's specific commute.